The Philadelphia Eagles landed at the U.S. Bank Stadium in Minneapolis, Minnesota, with one of their finest for the much-anticipated Super Bowl LII between the National Football Conference (NFC) champion, Philadelphia Eagles and the American Football Conference (AFC) champion, the New England Patriots. Flying with the Eagles in the tight end position is Zach Ertz as an offensive lineman and a wide receiver to block advancing opponents on running plays, as well as be sharp to catch passes, know his routes and hold the ball profitably. Zach Ertz is a huge asset and a well versed prolific player who has been soaring high with the Eagles since he joined them in 2013. The rudiments of the game run in his blood even as he is known to utilize all the resources on the field of play to attack dangerously and create obstacles for his opponents without being found wanting when it beckons on him to advance a pass to the opponents side. Check: Super Bowl Halftime Performers – Who is Performing at Super Bowl LII (52)? As he makes history on February 4, 2018, at the Super Bowl LII, here is all you should know about his biography; brother, wife and his girlfriend. We will also let you be in the know of his past injury and his net worth as he has been playing profitably in the NFL. Zach belongs to the generation who turned teenagers in the first decade of the new millennium. The Adult Zach Ertz of today was born a baby on November 10, 1990, as the eldest of four children (Nick Ertz, Jackson Ertz, and Shane Ertz) born by Doug and Lisa Ertz in Orange, California. His full name is Zachary Adam Ertz. His father Doug Ertz also played the game football and was contracted to Lehigh University from 1981 to 1984. The family of 6 would later relocate to Northern California when Zach was just 7 and this turned out to have properly propagated his interest in sports. Basketball was the sports he truly excelled in at first. His size was right for the game and he loved playing it, watching it, going for a rebound and catching the ball. He played basketball at Monte Vista High School in Danville, California. He focused much on playing basketball, hoping to land a career in the game. He recalled thinking he could get a scholarship to play basketball and probably played in the Ivy Leagues or a small D1 school. However, his mother continued to encourage him to participate in other sports which included football. He relented initially, worrying that his basketball vantage size would put him in an all offensive line in football which he didn’t want. He had a penchant for a creative position. With time, however, he relented and joined the Monte Vista High School (MVHS) football team in Danville California. As fate would have it, he was put in a position which made him the star of the team. He played the all-important quarterback, receiver and safety on the MVHS freshman squad which made him discover his inner love for football. In his time playing for MVHS, he had 56 receptions, recorded 756 receiving yards with 14 receiving touchdowns and was rewarded by naming him to the All-East Bay Athletic League first team. 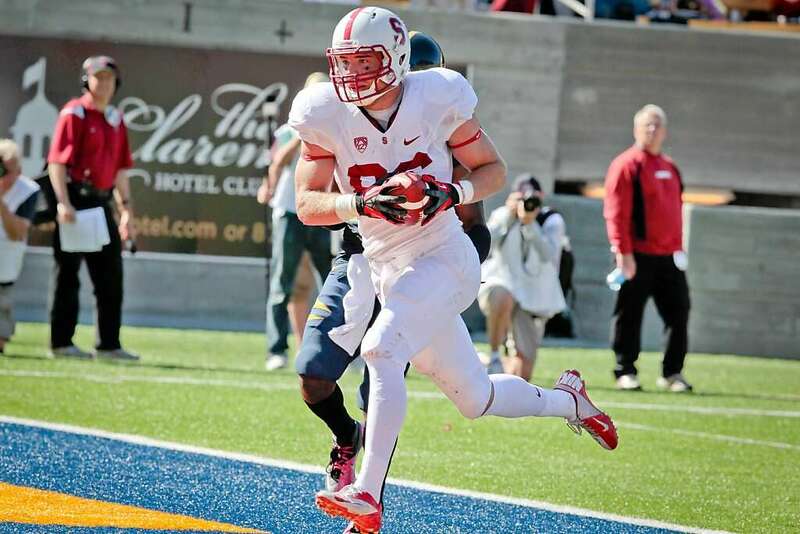 Zach Ertz left high school and got enrolled at Stanford University, where he played for the Stanford Cardinal football team from 2009 to 2012. He started playing for them right from his first year there and started becoming famous by 2010. He had 2 receptions which included a touchdown in the Orange Bowl of 2010. By 2011, his playing time increased as he recorded 27 receptions, 343 receiving yards with an applaudable 4 receiving touchdowns. Zach will for no reason slow down in 2012 as he had 69 catches, 898 receiving yards, and 6 touchdowns. In the Rose Bowl, he had 3 catches, 61 yards with 898 receiving yards which was the most recorded by an FBS tight end that season. It was clear he will go on to become a football star. He came in as a finalist for the Mackey Award, and an All-Pac-12 first team selection and a consensus All-American. He entered the NFL draft in 2012 with the Philadelphia Eagles selecting him in the second round as the 5th overall pick of the 2013 NFL Draft. He signed his professional contract with the Eagles on May 9, 2013, and since then, has proved himself as an indispensable member of the team. The Super Bowl LII is yet another epoch-making event for him to make his presence known before millions of fans all over the world. Zach Ertz is married to his 2012 girlfriend and professional soccer player Julie Beth Ertz (born April 6, 1992). She is a midfielder who plays on the homefront for the United States national women soccer team and the Chicago Red Stars of the National Women’s Soccer League (NWSL) on the club side. She is also a FIFA Women’s World Cup Champion (America) with more than 50 appearances and 14 goals for the national team. Zach and Julie met in 2012 when they both accidentally attended a baseball game at Stanford. Perhaps being sports people, they had a lot to talk about and the relationship between them went on well. 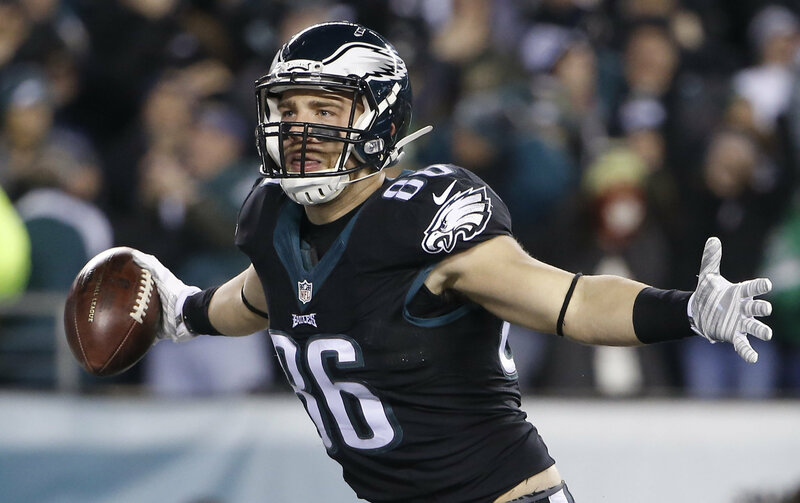 Zach Ertz popped the question of ‘will you marry me’? on February 26, 2016, at Klein Field, the Stanford U baseball stadium where they first met in 2012. She accepted and the got married on March 26, 2017, in Goleta, California. Their wedding was well attended by athletes as reported espn.com. As her husband is set to play in Super Bowl LII, she has been in the spotlight lately. In 2011, Zach had suffered a knee injury which caused him to miss 3 games in the season. However, he still ended the season with 27 receptions, 343 receiving yards and 4 receiving touchdowns. The injury was not one that would keep him out of the beautiful game for long as he made his return with better records in 2012. In December of 2017, Zach Ertz had another stint with injury, this time, a head injury when his side was taking on the Seattle Seahawks. He sustained the injury following a hit over the middle by safety Bradley McDougald in the third quarter. He was on the ground, seemingly dazed for some time but later stood up and walked off on his own. The Eagles lost that game 24-10 to the Seattle Seahawks. The good news today was he recovered fast enough from the injury and even played against New York Giants. Currently, he is still injury free and for no reason will he miss Super Bowl LII. Zach has been a successful American Football player. He is not yet at the zenith of his career but with a net worth of $16 million, he is certainly doing well and will surpass that amount in no distant time.